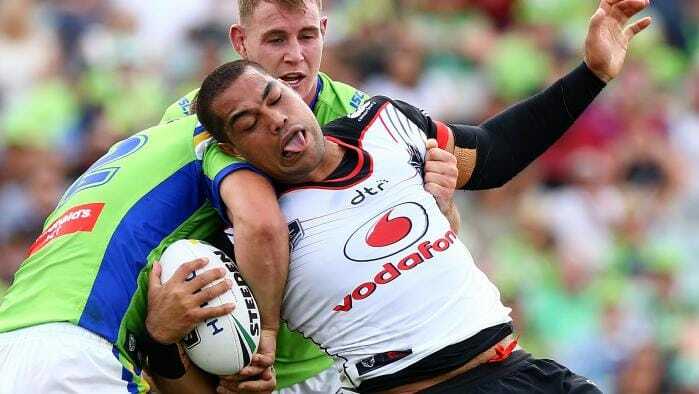 After their 2-0 season start the Nz Warriors ventured to the Australian Capital to face the 0-2 Canberra Raiders. The Warriors have never started a season 3-0 and very seldom taste victory in Canberra but this is no longer the Warriors of old, and they created a breathtaking come from behind victory to win 20-19. Wow, this was indeed a heart in mouth game to witness. My emotions were all over the place, but unlike 2017 I had the belief that the Warriors could come from behind and get the win. This leads me to my positives from the match. The attitude and self-belief this team has is fantastic, they were never ahead on the scoreboard until the dying seconds, but they kept their kept heads up and kept pushing forward. Roger Tuivasa-Sheck with more try saving antics on the goal line just showed the passion that is flowing from this team. It took repeat penalties (More on that in my negatives), and the Warriors being reduced to twelve men for the Raiders to get over the try line. 10 minutes into the match the Warriors were 12-0 down, the Warriors had been tackling for what seemed an age but it was the Raiders that started to look tired, this was evident when the Warriors charged down the field and scored on only their second opportunity with the ball in hand. The Warriors defence was still patchy, but when someone dropped off a tackle, there was another player ready to clean up. 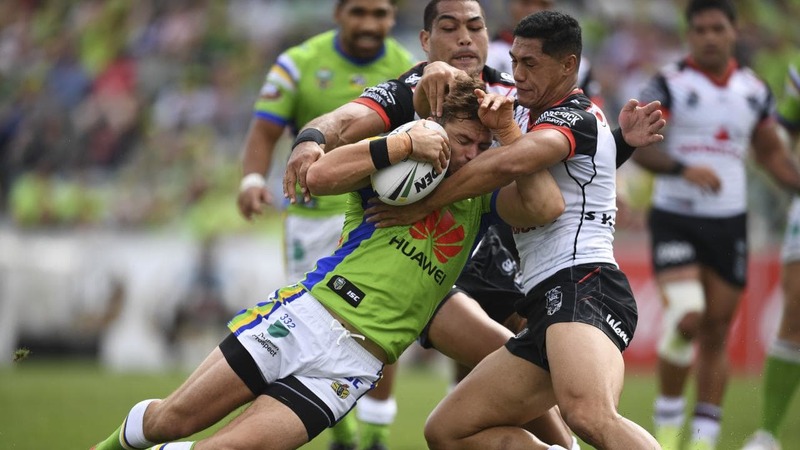 This Raiders side reminded me a lot of the 2017 Warriors, with about twenty minutes to go the Raiders started trying to protect their lead instead of adding to it, and much like the 2017 Warriors they watched the opposition catch up and pass them. There were several games last year like this match where the Warriors needed to set up and nail a field goal, but Shaun Johnson and the team did not get themselves in position correctly and looked lost. Well, this team learnt from those lessons, and with two minutes on the clock, they didn't rush or panic they were composed and charged down the field and Shaun slotted the required field goals with relative ease. A special mention needs to go to Sam Lisone who stayed on his feet on the last tackle to achieve the quick play the ball required to give Shaun that extra time to ensure his kick would be accurate. The forwards ran hard and fast again and really set the platform, Bunty Afoa, and Jazz Tevaga showed enormous impact from the bench, I like Sam Cook, but I think Jazz offers more to the side with Issac playing 80 minutes again. Shaun didn't run as much as he did in rounds one and two but he also didn't overplay his hand, Tohu Harris was causing all kinds of problems for the Raiders edge, so you cant blame Shaun for just getting him the ball in space. Shaun delivered when the Warriors needed him most, and you cant ask for much more than that. Fitness shined through yet again, the Raiders were clearly gassed very early on in the second half, and the Warriors looked like they could have continued playing for another half. If upcoming games are as tight as this then that fitness level could easily prove the difference between a win or loss. However, we have yet to see a perfect performance from this Warriors side which leads me to my negatives for Round 3. Penalties, I feel like I could save a template for my review and have penalties as my top negative as the Warriors are conceding far too many still. In the first ten minutes, the Warriors conceded six penalties, and the sin-binning of Adam Blair put the Warriors on the backfoot. If the Warriors were playing the Storm or the Cowboys, this could have easily have cost them more than 12 points. The defence needs work, as much as I like what Peta Hiku has been offering on attack. Fortunately these issues the Warriors currently have are easy to work on and if they can iron these kinks out, they are going to be tough to beat. My Warrior of the game for the second week in a row goes to Roger Tuivasa-Sheck. Roger continues to put his body on the line for this team, the enthusiasm he shows after making these big tackles is infectious. He leads the Warriors in running metres and line breaks, and I don't see any signs of him slowing down. This is the best Roger has been since signing with the Warriors and with Roger, Blake Green and Shaun Johnson controlling this backline the Warriors are always going to be dangerous with the ball in hand. My Warrior who needs to improve is Adam Blair. With the Warriors conceding back to back penalties and the referee warning Roger that if the Warriors continued to infringe that he would send someone to the bin, the last thing an experienced player like Adam should have done was throw a late hit at Aiden Sezer. If Adam had not been sin-binned, I don't believe the Raiders would have scored the 12 points they did, and the Warriors would have run away with an easy win. I do like the pressure Adam brings to the opposition halves on fifth tackle options, but he needs to find a better balance. Round four has the Warriors travelling to Sydney to face the 2-1 Sydney Roosters. This is going to be the biggest challenge the Warriors have faced in 2018 so far. The Roosters looked rusty in round one but have really started to mesh, and with new recruit Cooper Cronk leading the side they are going to be tough for the Warriors to overcome. After being sited Adam Blair and Sam Lisone have both plead guilty, and Adam is available to play, but Sam is suspended for the match, so I assume Albert Vete will be coming in for Sam. Call me an optimist, but I'm picking the Warriors to claim victory here by four. So that was an exciting Round 3, and as usual, I will leave you with some questions. What is your biggest concern in the Warriors performances to date? Who would you bring in to replace Sam Lisone? What are your score predictions for the Warriors Roosters clash?